When you’re running a business, you should always be thinking of ways to boost bookings, sales and income. The same applies when you’re running a photography business. Here are four ways that you can boost business, specifically for newborn photographers. Working with others in the newborn field is a great way of getting your photography business in front of a larger audience and therefore finding more potential customers. You can do this by creating partnerships within appropriate industries. For example, if you are working in the newborn industry you could approach local businesses also specialising in babies e.g. baby decor shops, baby clothing companies or even local baby or maternity groups. You could boost your business by attending local events. Perhaps your local town holds an annual fair or fete? Maybe there are multiple Christmas markets in the area that you could attend or perhaps they even have an industry-specific event. All are fantastic opportunities to boost your business and your customer base. Being part of a giveaway or prize is a great way of getting your business in front of a larger group of people you might be able to reach on your own. You could collaborate with you a local industry related business and set yourself up for a prize or discount. 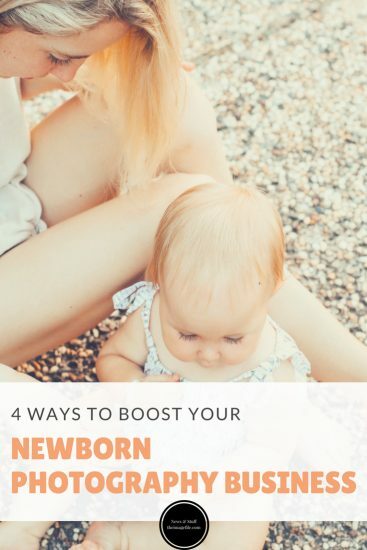 For example, you could approach a local playgroup and offer to be part of a raffle or you could approach a baby shop and create a special discount that one of their customers could win. The world is your oyster. Milestone sessions have also become an increasingly popular way for photographers to tie new parents into future sessions. This is a great way of boosting business through your existing customers. Some milestone sessions worth considering are 3 months, 6 months, 9 months and cake smash. You could even offer seasonal milestones such as baby’s first Christmas or baby’s first mother’s day etc. Baby Milestone Sessions To Offer 7 Sales Tips For Newborn Photographers Milestone Sessions You Could Be Offering Mother’s Day Page Sets 2017!